Melitta E970 Caffeo CI Review - Melitta's Best Coffee Machine? The Caffeo CI is one of our favourite bean-to-cup coffee machines. It's easy to use, can save up to four presets and produces taste espresso with a rich crema. The automatic milk system is also great for making cappuccino or latte at the touch of a button. 3.1 Can the Caffeo CI use ground coffee? The Melitta E970 Caffeo CI is a fully automatic bean-to-cup coffee machine with memory storage, a variety of customisation options and a stylish design. It also comes with a milk system, allowing you to make cappuccino without manually frothing milk. Can these feature justify a price tag that’s double the already excellent Caffeo Solo and Milk though? And how does the cappuccino and espresso taste? Keep reading our Melitta Caffeo CI review to find out! The Caffeo CI has an attractive design, albeit one that’s more “blocky” and functional than models such as the Gaggia Brera. The silver colour scheme helps it blend in with other kitchen appliances and it’s also not too bulky (although we wouldn’t call it a compact coffee machine). Note: This review is of the E970-101, which is the silver version, but there are also white (E970-102) and black (E970-103) options. On the inside, the CI has an automatic grinder and 15 bar pump. The grinder also combines with a pre-brew function to maximise flavour. During this process, water is injected into the coffee before brewing which draws out greater flavour. A 1.2 litre water tank is included. 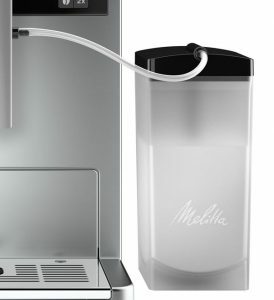 Like other Melitta models, this has a sensor that stops the machine if there isn’t any water. It’s a minor feature, but prevents problems should you forget to fill it up. One feature that isn’t found on many bean-to-cup coffee machines is the two-chamber container. This allows you to select between two types of bean by flicking a lever near the grinder. You could, for example, choose between crema or espresso beans depending on the type of coffee you feel like drinking. Unlike the cheaper Solo and Milk, the CI can also use ground coffee, which is great if you sometimes enjoy decaf or just want to try different blends. The Caffeo CI comes with two spouts. All coffee specialities can be made simultaneously in two cups. We also like how all coffee types are dispensed from the same spouts – there’s no need to move the cup around to add milk or espresso. Additionally, the spout can be moved up or down to accommodate different size glasses. The CI has a simple control panel. There aren’t any fancy features like app integration or a touch screen, but it’s easy and quick to use. On the left is a small display showing your current settings and options. The dial on right is used to quickly move through menus, while the top buttons allow you to select the coffee type (espresso, cafe crema, cappuccino, latte macchiato, warm/frothy milk and hot water.) There are also options for coffee strength and one or two cups. Instead of a manual steam frothing wand, the CI has a plug-in system for automatically frothing milk. To use this feature, the supplied tube attaches the milk container to the machine, making it truly “plug and play.” The container can also be quickly detached to store in the fridge or for cleaning. Considering how difficult it is to produce consistently frothy milk with a steam wand, the milk system is a great addition if you enjoy milky coffee. There’s also the option to save up to four presets in the machine’s memory, so you don’t need to reset your preferences for each brew. While this is a useful feature for any coffee drinker, it’s particularly handy for families who all have their own tastes. Once saved, each preset can be used at the touch of a single button. As you would expect from a premium coffee machine, the CI can consistently produce rich and aromatic espresso. It also produces an excellent crema. As with all bean-to-cup machines, be prepared to spend a few days experimenting to find your ideal taste. Once you’ve found your perfect settings, however, the memory mode means you can quickly access them at any time. As the CI comes with an automatic milk system, it’s able to automatically make drinks such as latte macchiato and cappuccino without using a manual steam wand. 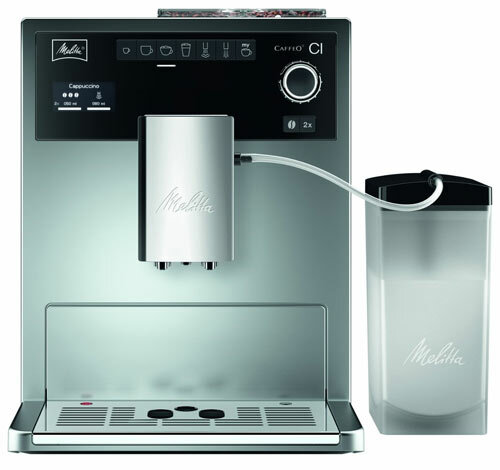 Melitta claims the CI follows the exact steps required to make authentic milky coffees. For the cappuccino, the machine makes a strong espresso and tops it with the classic “hood” of frothy, creamy milk. This allows the crema to show at the sides of the milk. For lattes, warmed milk froth and milk are put into the glass, before espresso is added to settle between the milk and froth. While this might not sound important, the order a cappuccino or latte is made can have a noticeable effect on taste. It also ensures the coffee has the authentic appearance you’d expect from a cafe. Most importantly, all the varieties taste fantastic and the frothed milk has a professional consistency. Like most bean-to-cup coffee machines, the CI has an automatic cleaning program. The machine automatically rinses when it’s turned on or off, which helps keep it in top condition without much effort. You’ll need to connect the milk tube to the drip tray for this but otherwise it’s automatic. The downside is that the rinsing fills up the drip tray relatively quickly, so you’ll need to empty it more often. Fortunately, the tray is easy to remove and empty. The brewing unit can be quickly removed for cleaning, which is important to prevent coffee build-up. There’s also an automatic descaling program that should be run every couple of months. As you would expect, the milk system requires extra cleaning to to keep it hygienic. Melitta supplies a fluid for cleaning the system on a weekly basis. The machine also reminds you to use a descaling tablet via the ground container when needed. Overall, the CI doesn’t require a huge amount of maintenance – but be prepared to spend a little time each week keeping it in top condition. Several features are included to reduce energy consumption, including an automatic switch-off setting and a “0-Watt” button. The latter disconnects the machine from the mains supply without needing to unplug it. There’s also an energy saving mode to reduce energy costs further. 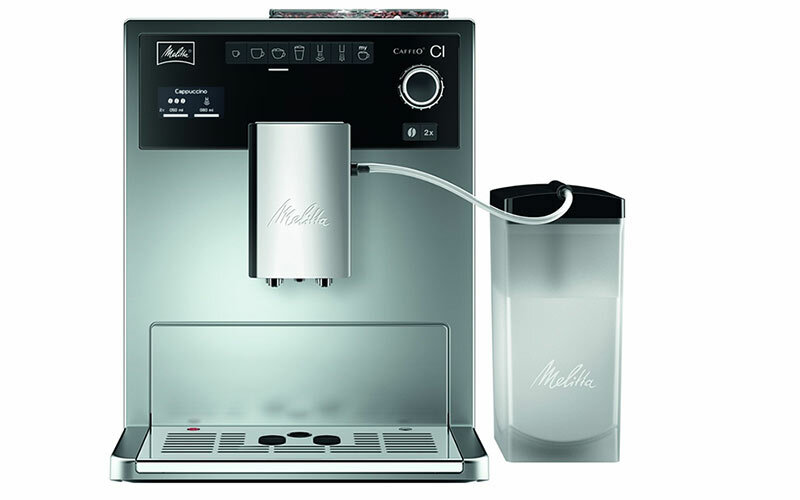 The Melitta Caffeo CI price (£1000 RRP) means that it’s certainly not a budget model. In fact, it’s one of the most expensive on our list of the best bean-to-cup coffee machines. Despite the high price tag, we think it provides great value for money if you’re a coffee enthusiast who wants to drink espresso, cappuccino and latte at the touch of a button. There are cheaper options if you don’t mind manually frothing milk though. Can the Caffeo CI use ground coffee? Yes, there is a compartment for using ground coffee. When combined with the two-chamber bean container, this means you can select between three coffee types when brewing. At the start of this review, we asked whether the Melitta E970 Caffeo CI could justify being double the price of the Caffeo Solo and Milk. We think the answer is “yes” – especially if you enjoy cappuccino or latte and want a “one touch” solution. While the Solo and Milk is an excellent bean-to-cup machine for the price, the Caffeo CI improves on it in almost every way. It has more options for customising your coffee (including the ability to use ground coffee), includes a memory mode for storing presets and can automatically produce cappuccino with a single button press. We also like the simplicity of the control panel. In summary, the Melitta Caffeo CI bean-to-cup coffee machine is an excellent choice if you’re looking for a premium model without breaking the £1000 barrier. It produces fantastic espresso and cappuccino, is easy to use and looks great in the kitchen. We highly recommend it.